"King salmon" redirects here. It is not to be confused with King Salman of Saudi Arabia. The Chinook salmon /ʃɪˈnʊk/ (Oncorhynchus tshawytscha) is the largest species in the Pacific salmon genus Oncorhynchus. The common name refers to the Chinookan peoples. 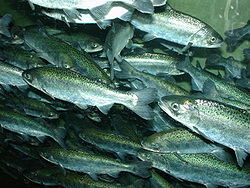 Other vernacular names for the species include king salmon, Quinnat salmon, spring salmon, chrome hog, and Tyee salmon. The scientific species name is based on the Russian common name chavycha (чавыча). Historically, the native distribution of Chinook salmon in North America ranged from the Ventura River in California in the south to Kotzebue Sound in Alaska in the north. Populations have disappeared from large areas where they once flourished, however, shrinking by as much as 40 percent. In some regions, their inland range has been cut off, mainly by dams and habitat alterations: from Southern California, some areas east of the Coast Ranges of California and Oregon, and large areas in the Snake River and upper Columbia River drainage basins. In certain areas like California's Sacramento-San Joaquin Delta, it was revealed that extremely low populations of juvenile Chinook salmon (less than 1%) were surviving. In the western Pacific, the distribution ranges from northern Japan (Hokkaido) in the south to the Arctic Ocean as far as the East Siberian Sea and Palyavaam River in the north. Nevertheless, they are consistently present and the distribution is well known only in Kamchatka. Elsewhere, information is scarce, but they have a patchy presence in the Anadyr River basin and parts of the Chukchi Peninsula. Also in parts of the northern Magadan Oblast near the Shelikhov Gulf and Penzhina Bay stocks might persist, but remain poorly studied. In 1967, the Michigan Department of Natural Resources planted Chinook in Lake Michigan and Lake Huron to control the alewife, an invasive species of nuisance fish from the Atlantic Ocean. Alewives then constituted 90% of the biota in these lakes. Coho salmon had been planted the year before and the program was a success. Chinook and Coho salmon thrived on the alewives and spawned in the lakes' tributaries. After this success, Chinook were planted in the other Great Lakes, where sport fishermen prize them for their aggressive behavior on the hook. The species has also established itself in Patagonian waters in South America, where both introduced and escaped hatchery fish have colonized rivers and established stable spawning runs. Chinook salmon have been found spawning in headwater reaches of the Rio Santa Cruz, apparently having migrated over 1,000 km (620 mi) from the ocean. The population is thought to be derived from a single stocking of juveniles in the lower river around 1930. Sporadic efforts to introduce the fish to New Zealand waters in the late 1800s were largely failures and led to no evident establishments. Early ova were imported from the Baird hatchery of the McCloud River in California. Further efforts in the early 1900s were more successful and subsequently led to the establishment of spawning runs in the rivers of Cantebury and North Otago; Rangitata River, the Opihi River, the Ashburton River, the Rakaia River, the Waimakariri River, the Hurunui River, and the Waiau River. The success of the latter introductions is thought to be partly attributable to the use of ova from autumn-run populations as opposed to ova from spring-run populations used in the first attempts. Whilst other salmon have also been introduced into New Zealand, only Chinook (or King salmon as it is known locally in NZ) salmon have established sizeable pelagic runs. The Chinook is blue-green, red, or purple on the back and top of the head, with silvery sides and white ventral surfaces. It has black spots on its tail and the upper half of its body. Chinook have a Black gum line which is present in both salt and freshwater. Adult fish range in size from 24 to 36 in (61 to 91 cm), but may be up to 58 in (150 cm) in length; they average 10 to 50 lb (4.5 to 22.7 kg), but may reach 130 lb (59 kg). In the Kenai River of Alaska, mature Chinook averaged 16.8 kg (37 lb). The current sport-caught world record, 97.25 lb (44.11 kg), was caught on May 17, 1985, in the Kenai River (Kenai Peninsula, Alaska). The commercial catch world record is 126 lb (57 kg) caught near Rivers Inlet, British Columbia, in the late 1970s. 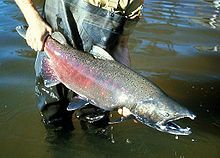 Chinook may spend one to eight years in the ocean (averaging from three to four years) before returning to their home rivers to spawn. The salmon also undergo radical morphological changes as they prepare for the spawning event ahead. All salmon lose the silvery blue they had as ocean fish, and their colour darkens, sometimes with a radical change in hue. Salmon are sexually dimorphic, and the male salmon develop canine-like teeth and their jaws develop a pronounced curve or hook, called a "kype". Studies have shown that larger and more dominant male salmon have a reproductive advantage as female Chinook are often more aggressive toward smaller males. Chinook spawn in larger and deeper waters than other salmon species and can be found on the spawning redds (nests) from September to December. 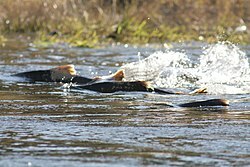 The female salmon may lay her eggs in four to five nesting pockets within a redd. After laying eggs, females guard the redd from four to 25 days before dying, while males seek additional mates. It has been observed[by whom?] that females are typically 98% successful at guarding their redds. Chinook eggs hatch, 90 to 150 days after deposition, depending upon water temperature. Egg deposits are timed to ensure the young salmon fry emerge during an appropriate season for survival and growth. Fry and parr (young fish) usually stay in fresh water 12 to 18 months before traveling downstream to estuaries, where they remain as smolts for several months. Some Chinooks return to the fresh water one or two years earlier than their counterparts, and are referred to as "jack" salmon. "Jack" salmon are typically less than 24 inches (61 cm) long, but are sexually mature and return at an earlier age. The Yukon River has the longest freshwater migration route of any salmon, over 3,000 km (1,900 mi) from its mouth in the Bering Sea to spawning grounds upstream of Whitehorse, Yukon. Since Chinook rely on fat reserves for energy upon entering fresh water, commercial fish caught here are highly prized for their unusually high levels of heart-healthy omega-3 fatty acids. However, the high cost of harvest and transport from this exceptionally rural area limits its affordability. The highest in elevation Chinook migrate to spawn is in the Upper Salmon River and Middle Fork of the Salmon River in Idaho. These anadromous fish travel over 7,000 feet (2,100 m) in elevation, and over 900 miles (1,400 km), in their migration through eight dams and reservoirs on the Columbia and Lower Snake Rivers. Chinook eat insects, amphipods, and other crustaceans while young, and primarily other fish when older. Young salmon feed in streambeds for a short period until they are strong enough to journey out into the ocean and acquire more food. Chinook juveniles divide into two types: ocean-type and stream-type. Ocean-type chinook migrate to salt water in their first year. Stream-type salmon spend one full year in fresh water before migrating to the ocean. After a few years in the ocean, adult salmon, then large enough to escape most predators, return to their original streambeds to mate. Chinook can have extended lifespans, where some fish spend one to five years in the ocean, reaching age eight. More northerly populations tend to have longer lives. Salmon, for spawning, need adequate spawning habitat. Clean, cool, oxygenated, sediment-free fresh water is essential for egg development. Chinook use larger sediment (gravel) sizes for spawning than other Pacific salmon. Riparian vegetation and woody debris help juvenile salmon by providing cover and maintaining low water temperatures. Chinook also need healthy ocean habitats. Juvenile salmon grow in clean, productive estuarine environments and gain the energy for migration. Later, they change physiologically to live in salt water. They rely on eelgrass and seaweeds for camouflage (protection from predators), shelter, and foraging habitat as they make their way to the open ocean. Adult fish need a rich, open ocean habitat to acquire the strength needed to travel back upstream, escape predators, and reproduce before dying. In his book King of Fish, David Montgomery writes, "The reserves of fish at sea are important to restocking rivers disturbed by natural catastrophes." Thus, it is vitally important for the fish to be able to reach the oceans (without man-made obstructions such as dams), so they can grow into healthy adult fish to sustain the species. The bodies of water for salmon habitat must be clean and oxygenated. One sign of high productivity and growth rate in the oceans is the level of algae. Increased algal levels lead to higher levels of carbon dioxide in the water, which transfers into living organisms, fostering underwater plants and small organisms, which salmon eat. Algae can filter high levels of toxins and pollutants. Thus, it is essential for algae and other water-filtering agents to not be destroyed in the oceans because they contribute to the well-being of the food chain. Salmon need other salmon to survive so they can reproduce and pass on their genes in the wild. With some populations endangered, precautions are necessary to prevent overfishing and habitat destruction, including appropriate management of hydroelectric and irrigation projects. If too few fish remain because of fishing and land management practices, salmon have more difficulty reproducing. When one of these factors is compromised, affected stock can decline. One Seattle Times article states, "Pacific salmon have disappeared from 40 percent of their historic range outside Alaska," and concludes it is imperative for people to realize the needs of salmon and to try not to contribute to destructive practices that harm salmon runs. In the Pacific Northwest, the summer runs of especially large Chinook once common (before dams and overfishing led to declines) were known as June hogs. A Chinook's birthplace and later evolution can be tracked by looking at its otolith (ear) bone. The bone can record the chemical composition of the water the fish had lived in just like a tree's growth rings provide hints on dry and wet years. The bone is built with the chemical signature of the environment that hosted the fish. Researchers were able to tell where different individuals of Chinook were born and lived in the first year of their lives. Testing was done by measuring the strontium in the bones. Strontium can accurately show researchers the exact location and time of a fish swimming in a river. The total North Pacific fisheries harvest of the Chinook salmon in 2010 was some 1.4 million fish, corresponding to 7,000 tonnes; 1.1 million of the fish were captured in the United States, others were divided by Canada and Russia. The share of Chinook salmon from the total commercial Pacific salmon harvest was less than 1% by weight, and only some 0.3% of the number of fish. The trend has been down in the captures from the pre-1990 times, when the total harvest was around 25,000 tonnes. 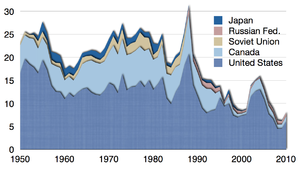 Global production has, however, remained at a stable level due to increased aquaculture. 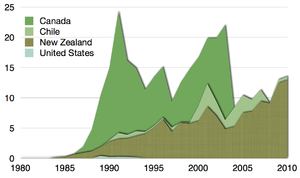 The worlds' largest producer and market supplier of the Chinook salmon is New Zealand. Marketed as King salmon, in 2009, New Zealand exported 5,088 tonnes of salmon equating to a value of NZ$61 million in export earnings. For the year ended March 2011, this amount had increased to NZ$85 million., New Zealand accounts for about half of the global production of Chinook salmon, and about half of New Zealand's production is exported. Japan is New Zealand's largest export market, with stock also being supplied to other countries of the Pacific Rim, including Australia. Farming of the species in New Zealand began in the 1970s, when hatcheries were initially set up to enhance and support wild fish stocks with the first commercial operations initiating in 1976. After some opposition against their establishment by societal groups, including anglers, the first sea cage farm was established in 1983 at Big Glory Bay in Stewart Island by British Petroleum NZ Ltd. Today, the salmon are hatched in land-based hatcheries (several of which exist) and transferred to sea cages or freshwater farms, where they are grown out to harvestable size of 3–4 kilograms (6.6–8.8 lb). The broodstock for the farms is usually selected from existing farm stock or sometimes sourced from wild populations. Eggs and milt are stripped manually from sexually mature salmon and incubated under conditions (around 10–12 °C (50–54 °F)), replicating the streams and rivers where the salmon would spawn naturally. After hatching, the baby salmon are typically grown to smolt stage (around six-months of age) before they are transferred to the sea cages or ponds. Most sea cage farming occurs in the Marlborough Sounds, Stewart Island, and Akaroa Harbour, while freshwater operations in Canterbury, Otago, and Tasman use ponds, raceways, and hydrocanals for growout operations. Low stocking densities, ranging between less than 1 kg/m3 and around 25 kg/m3 (depending on the life stage of the salmon) and the absence of disease in the fish means New Zealand farmers do not need to use antibiotics or vaccines to maintain the health of their salmon stocks. The salmon are fed food pellets of fish meal specially formulated for Chinook salmon (typical proportions of the feed are: 45% protein, 22% fat, and 14% carbohydrate plus ash and water) and contain no steroids or other growth enhancers. Regulations and monitoring programmes ensure salmon are farmed in a sustainable manner. The planning and approval process for new salmon farms in New Zealand considers the farm's potential environmental effects, its effects on fishing activities (if it is a marine farm), and any possible cultural and social effects. In the interest of fish welfare, a number of New Zealand salmon farming operations anaesthetise salmon before slaughter using Aqui-S™, an organically based anaesthetic developed in New Zealand that is safe for use in food and which has been favourably reported on by the British Humane Slaughter Association. In recognition of the sustainable, environmentally conscious practices, the New Zealand salmon farming industry has been acknowledged as the world's greenest by the Global Aquaculture Performance Index. Globally, Chile is the only country other than New Zealand currently producing significant quantities of farmed Chinook salmon. The United States has not produced farmed Chinook in commercial quantities since 1994. New Zealand will likely remain the major producer of the species as other countries' (predominantly Norway, Canada and the United Kingdom) salmon productions are focused typically on other species such as Atlantic and coho salmon. Although the FAO reported no aquaculture production by Canada after 2004, as displayed in the graph above, reports by Statistics Canada contradict this, and show the production of aquaculture salmon, mostly from British Columbia, continued unabated to at least 2009. Nine populations of Chinook salmon are listed under the U.S. Endangered Species Act as either threatened or endangered. The Snake River fall-run population is being considered for delisting. Fisheries in the U.S. and Canada are limited by impacts to weak and endangered salmon runs. The fall and late-fall runs in the Central Valley population in California is a U.S. National Marine Fisheries Service (NMFS) Species of Concern. In April 2008, commercial fisheries in both Oregon and California were closed due to the extremely low population of Chinook salmon present. The low population is being blamed on the collapse of the Sacramento River run, one of the biggest south of the Columbia. In April 2009 California again canceled the season. The Pacific Fishery Management Council's goal for the Sacramento River run is an escapement total (fish that return to freshwater spawn areas and hatcheries) of 122,000–180,000 fish. The 2007 escapement was estimated at 88,000, and the 2008 estimate was 66,000 fish. Scientists from universities and federal, state, and tribal agencies concluded the 2004 and 2005 broods were harmed by poor ocean conditions in 2005 and 2006, in addition to "a long-term, steady degradation of the freshwater and estuarine environment." Such conditions included weak upwelling, warm sea surface temperatures, and low densities of food. In Oregon, the 2010 spring Chinook run was forecasted to increase by up to 150% over 2009 populations, growing from 200,000 to over 500,000, making this the largest run in recorded history. Lower temperatures in 2008 North Pacific waters brought in fatter plankton, which, along with greater outflows of Columbia River water, fed the resurgent populations. The Oregon Department of Fish and Wildlife estimated 80% of them were hatchery-born. Chinook runs in other habitats have not recovered proportionately. In April 2016 Coleman National Fish Hatchery outside of Red Bluff, California released 12 million baby Chinook salmon, with many salmon being tagged in order to be monitored. The release was done in hopes to help restore the salmon population of Battle Creek. The Chinook salmon is spiritually and culturally prized among certain First Nations peoples. Many celebrate the first spring Chinook caught each year with "first-salmon ceremonies". While salmon fishing is still important economically for many tribal communities, the Chinook harvest is typically the most valuable. Chinook salmon were described and enthusiastically eaten by the Lewis and Clark Expedition. Lewis wrote that, when fresh, they tasted better than any other fish he had ever eaten. They did not particularly like dried or "pounded" salmon. Lewis and Clark knew about Pacific salmon, but had never seen one. The Western world had known about Pacific salmon since the late 18th century. 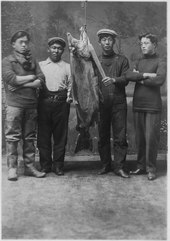 Maritime fur traders and explorers, such as George Vancouver, frequently acquired salmon by trade with the indigenous people of the Northwest coast. Lewis and Clark first encountered Chinook salmon as a gift from Chief Cameahwait, on August 13, 1805, near Lemhi Pass. Tasting it convinced Lewis they had crossed the continental divide. Known as the "king salmon" in Alaska for its large size and flavorful flesh, the Chinook is the state fish of this state and of Oregon. ^ "National Oceanic and Atmospheric Administration. North Central California Coast Recovery Domain" (PDF). westcoast.fisheries.noaa.gov. National Marine Fisheries Service Southwest Region. Retrieved 9 May 2016. ^ Robert Behnke (6 July 2010). Trout and Salmon of North America. Simon and Schuster. ISBN 978-1-4516-0355-2. Retrieved 2017-01-14. ^ "Salmon: Background". Pacific Fishery Management Council. Retrieved 2010-03-05. ^ a b Cameron, Mindy (2002-08-18). "Salmon Return; A Public Conversation About the Future of a Northwest Icon". The Seattle Times. Seattle, Washington: The Seattle Times. ^ a b c Augerot, Xanthippe; Foley, Dana Nadel (2005). Atlas of Pacific salmon: the first map-based status assessment of salmon in the North Pacific. University of California Press. pp. 80–83. ISBN 978-0-520-24504-4. ^ Demetras, Nicholas (February 3, 2016). "Development of underwater recorders to quantify predation of juvenile Chinook salmon (Oncorhynchus tshawytscha) in a river environment" (PDF). Fishery Bulletin. 114: 179–185. doi:10.7755/fb.114.2.5. Retrieved 8 May 2016. ^ Riva Rossi, CM; Pascual, MA; Aedo Marchant, E; Basso, N; Ciancio, JE; Mezga, B; Fernández, DA; Ernst-Elizalde, B (28 Nov 2012). "The invasion of Patagonia by Chinook salmon (Oncorhynchus tshawytscha): inferences from mitochondrial DNA patterns". Genetica. Grupo de Estudios de Salmónidos Anádromos (GESA), Centro Nacional Patagónico (CENPAT-CONICET). 140: 439–53. doi:10.1007/s10709-012-9692-3. PMID 23188114. ^ Williams, Richard Nicholas (2006). Return to the river: restoring salmon to the Columbia River. Academic Press. p. 187. ISBN 978-0-12-088414-8. Retrieved 19 October 2011. ^ a b c d McDowell, R.M. (1994) Gamekeepers for the Nation. Chapter 18. Canterbury University Press: Christchurch. ^ McDowall, R. M. (1994). The origins of New Zealand's chinook salmon, Oncorhynchus tshawytscha. Marine Fisheries Review, 1/1/1994. ^ "Marine saltwater data" (PDF). wdfw.wa.gov. 2014. ^ Burger, C. V., Wilmot, R. L., & Wangaard, D. B. (1985). Comparison of spawning areas and times for two runs of chinook salmon (Oncorhynchus tshawytscha) in the Kenai River, Alaska. Canadian Journal of Fisheries and Aquatic Sciences, 42(4), 693-700. ^ West-Eberhard, M.J. (2003). Developmental Plasticity and Evolution. Oxford University Press. ^ Baxter, Randall (May 1991). Chinook Salmon Spawning Behavior : Evidence for Size-dependent Male Spawning Success and Female Mate Choice (PDF). Humboldt State University. pp. iii. Retrieved May 8, 2016. ^ Klinger, Terrie. Lecture. 15 April 2005. What Defines the Pacific Northwest Marine Realm Ecologically and Geographically? University of Washington; Seattle, WA. ^ "CHINOOK SALMON HOLD TINY ARCHIVES WITH THEIR ENTIRE LIFE HISTORY". wallstreetotc.com. 2015-05-18. Retrieved 2015-05-18. ^ a b c d e f g h "Fisheries and Aquaculture Department Statistics". Food and Agriculture Organization of the United Nations. Retrieved 2012-09-15. ^ Annual Statistics 2010: Commercial salmon catch by species and country North Pacific Anadromous Fish Commission Statistical Yearbook. Retrieved 2015 March 16. The statistics do not include fish taken in Russian waters by non-Russian fleet. ^ a b c "Aquaculture New Zealand Industry Overview". Retrieved September 20, 2011. ^ a b c "AQUACULTURE.GOVT.NZ/Industry development". Retrieved September 26, 2011. ^ a b "The NZ Salmon Farmer's Association Inc". The association of the New Zealand Salmon farming industry. Archived from the original on October 6, 2011. Retrieved September 20, 2011. ^ "Global Aquaculture Performance Index". Seafood Ecology Research, University of Victoria, Canada. Retrieved September 20, 2011. ^ Statistics Canada. "'Aquaculture Activity in Canada'". Archived from the original on 2012-06-15. Retrieved 2012-10-14. ^ "Fish Species Protected Under the Endangered Species Act (ESA)". Office of Protected Resources - NOAA Fisheries. 2010-03-05. Retrieved 2010-03-05. ^ NMFS. Listing Endangered or Threatened Species; 90-Day Finding on a Petition To Delist the Snake River Fall-Run Chinook Salmon Evolutionarily Significant Unit.Federal Register;; v80, (April 22, 2015), 22468-22472. ^ Blankship, Donna. Salmon Fishing Banned Along U.S. West Coast. National Geographic. http://news.nationalgeographic.com/news/2008/04/080411-AP-disappearin_2.html. April, 2008. ^ David Gorn. "What's Killing California's Salmon?". NPR. ^ Millman, Joel (January 21, 2010). "Fish Boom Makes Splash in Oregon". Wall Street Journal. Retrieved January 21, 2010. ^ Anderson. "Millions Of Chinook Salmon Released Into Northern California Waterways". CBS. CBS. Retrieved May 8, 2016. ^ Isserman, Maurice (2005). Across America: the Lewis and Clark expedition. Infobase Publishing. pp. 115, 133, 135. ISBN 978-0-8160-5256-1. Retrieved 19 October 2011. ^ Bruce Alden Cox (1987). Native people, native lands: Canadian Indians, Inuit and Métis. McGill-Queen's Press - MQUP. p. 174. ISBN 978-0-88629-062-7. Retrieved 19 October 2011. ^ Elin Woodger; Brandon Toropov (2004). Encyclopedia of the Lewis and Clark Expedition. Infobase Publishing. p. 138. ISBN 978-0-8160-4781-9. Retrieved 19 October 2011. ^ "Alaska State Fish". statesymbolsusa.org. Retrieved 2014-02-02. ^ "Oregon State Fish". statesymbolsusa.org. Retrieved 2014-02-02. "Oncorhynchus tshawytscha". Integrated Taxonomic Information System. Retrieved 30 January 2006. Froese, Rainer and Pauly, Daniel, eds. (2005). "Oncorhynchus tshawytscha" in FishBase. 10 2005 version. Chinook salmon NOAA FishWatch. Retrieved 4 November 2012. Wikimedia Commons has media related to Oncorhynchus tshawytscha. This page was last edited on 16 March 2019, at 16:44 (UTC).